This image forwarded on WhatsApp makes the following claims about Cristiano Ronaldo. Are these claims about him true? The drinking and tattoo claims seem to be true. 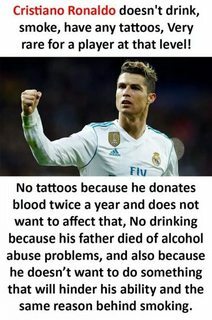 Does Ronaldo not have any tattoos so that he can donate blood more freely? This seems to be correct. Various places report it online, for example Yahoo Sports. Yahoo sports cites Diretta News in its article. Does Ronaldo refuse to drink, and is it because of his father's alcohol problems? This, again, seems to be correct. ESPN seems to confirm that Ronaldo's father had a drinking problem, and it made his upbringing difficult. When Ronaldo talks about his dad now, he acknowledges the violence and alcoholism but blames his dad's war experience on his failings, when really it was just something inside Aveiro that did him in, just as it is something inside Ronaldo that made his fame and success possible, too. Sportsmole reports that the death was due to "liver disease cirrhosis". In terms of not drinking, we have this story from USA Today that details Ronaldo receiving libel damages from the Daily Mirror after it published a story claiming he was drinking in a club while recovering from an injury. Real Madrid soccer star Cristiano Ronaldo has accepted libel damages from a tabloid newspaper that claimed he drank heavily and danced at a nightclub while recovering from a foot injury in Los Angeles. Ronaldo, who says he does not drink alcohol, received an undisclosed amount of compensation and an apology from the Daily Mirror when the case came before the High Court on Monday. Ronaldo said in a statement that he takes training and recovery from injuries seriously, adding that he would never have "gone on a bender" and danced in a nightclub after discarding his crutches as the Mirror claimed in July 2008. I was not able to find any compelling evidence either way with regards to Cristiano Ronaldo smoking, but I would consider it unlikely considering his status as a world-class athlete. Not the answer you're looking for? Browse other questions tagged sport alcohol smoking celebrities . Does forcing a young child to smoke a cigarette discourage longer term use?